Phase II specifics will also be driven by lessons learned and several other factors: progress on Phase I; the Phase II Program Action Directive (PAD) and Programming Plan (PPlan); and further direction from USAF, other national leadership, and USCYBERCOM on supporting combatant commands and other national requirements. 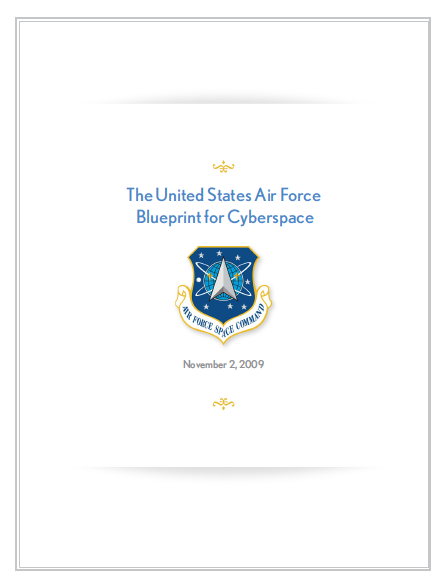 The objectives of this blueprint align from the Presidential Guidance down through the USAF priorities and AFSPC 2010 goals, and will be integrated into the USAF Space and Cyberspace Service Core Function Plan. The results of this blueprint will contribute significantly to the AF vision to “Fly, Fight and Win … in Air, Space and Cyberspace.” Additionally, this blueprint incorporates the initial goals and guidance from the Secretary of Defense and joint community ensuring USAF cyber efforts complement those of other cyber participants, provide maximum benefits to the joint fight and contribute significantly to the national cyber effort. Cyberspace touches practically everything and everyone every day. The security and prosperity of our nation is dependent on freedom of access to and freedom of action in cyberspace. While there are many benefits that come with this access, there are numerous inherent vulnerabilities. Threats via cyberspace pose one of the most serious national security challenges of the 21st Century. The threat is asymmetrical with a minimal cost of entry; events of the last several years show that one person, with one computer, can affect an entire nation. Growing arrays of adversaries are targeting the US military and our critical national infrastructure, commerce and citizens. The combined and coordinated efforts of government, industry and academia will be required to effectively counter many of these attacks and assure mission success in the future. The USAF will strive to change its cultural mindset in the day-to-day execution of cyber operations. The importance of cultivating a new mindset cannot be overstated. It demands a fundamental shift in leadership that encourages creative, yet critical thinking and rewards innovative activities and solutions. Cyberspace does not function independently of other capabilities provided by the USAF or other DOD agencies. For example, the question of capability integration is broader than just the USAF and requires an understanding of how USAF cyber capabilities may leverage or be leveraged by the capabilities of the other military services and mission partners. In addition, the integration and acculturation of cyberspace must permeate doctrine development, accession and advanced training, professional military education, exercises, war games, recruitment and day-to-day operations. A cultural change is also critical in the USAF operation and defense of the AF-GIG. Every USAF airman, government civilian, and contract partner must become a cyber defender. The United States is vulnerable to cyber attacks by relentless adversaries attempting to infiltrate our networks- at work and at home- millions of times a day, 24/7 planting malicious code, worms, botnets and hooks in common websites, software and hardware, such as thumb-drives, printers, etc. Once implanted, this code begins to distort, destroy and manipulate information, or “phone” it home. Certain code allows US adversaries to obtain higher levels of credentials to access highly sensitive information. Adversaries attack computers at work and at home knowing Airmen communicate with the AF network via email or transfer information from one system to another. As always, USAF Airmen are the core of our mission success; and the civilians and contract partners of the USAF also play a unique and critical role. Technical competence alone is not sufficient to meet the challenges of the 21st century. Airmen must be technically astute, tactically competent, armed with warrior ethos and equally prepared to deploy forward or operate in place to accomplish the mission. The USAF will increase cyber expertise by implementing a focused recruitment strategy, a specific and carefully managed cyber career pathway and career-long professional development. The USAF will increase opportunities for education and provide specialized organic cyber operational training to include a centrally managed force of trained personnel with forensic and other specialized skills. The USAF will develop procedures to identify and track cyber professionals within the USAF personnel system and leverage the contributions of the Air National Guard and Air Force Reserve Command to develop and present unique capabilities.